Drone photo of the explosion via Christopher Hiller. A woman was killed in her home by an explosion Monday morning involving a truckload of airbag detonation triggers which was on its way to a Takata automotive parts plant, according to multiple reports. According to Conexion Del Rio, 69 year-old Lucila Robles was killed in her home following by the explosion of a truckload of airbag detonators that crashed in front of the house. According to authorities the woman, who lived alone at her home located on U.S. Highway 277, near the intersection with FM 1666, was alone Monday morning, when the truck came off the road, caught on fire and exploded just in front of the structure. The truck, hauling a flatbed trailer loaded with airbag cartridges, was traveling from Del Rio to the Takata plant in Eagle Pass, Texas. The driver of the truck, identified as Mario Alberto Rodriguez, 20-years-of-age, was injured along with a passenger. They were able to flee the truck before the blast. An older couple, traveling in a Toyota SUV, was also injured during the explosion. All four injured victims were transported to a hospital in Eagle Pass, and later airlifted to San Antonio. The woman was initially reported missing, but the two-day search for her ended when dental pieces found at the scene of the explosion were discovered to be Roberts. Takata, the company now infamous for an airbag defect cover-up that led to the deaths of 13 confirmed people, the injuries of hundreds more and one of the largest recalls in history involving nearly 100 million vehicles, operates a plant in Eagle Pass, Texas which is where the truck involved in the explosion was reportedly headed. Pieces of the exploded truck were reportedly found up to a mile from the blast location, and ten surrounding homes were damaged. The highway was closed for 30 hours to repair the crater damage. 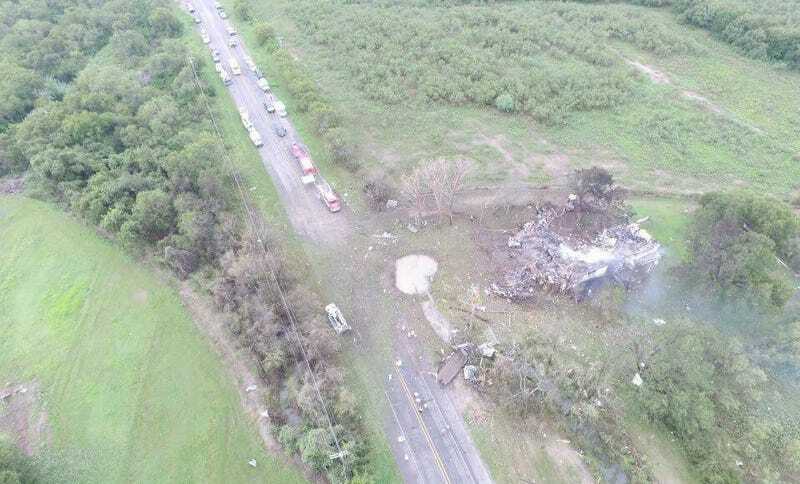 The Texas Department of Safety is investigating the cause of the explosion, and according to News4SA.com, officials confirmed it wasn’t caused by a collision. Jalopnik has reached out to Takata to confirm that the airbag parts loaded on truck were the company’s supplies, and will update this post with more information as we have it. Can All Of The Defective Takata Airbags Ever Be Completely Recalled?